Manmade global warming was likely a significant contributing factor in Australia’s “Angry Summer” of 2012-2013, according to a new study. It was the country’s hottest on record and featured devastating wildfires as well as widespread flooding. The research, to be published in an upcoming issue of the journal Geophysical Research Letters, shows that global warming has increased the chances of Australians experiencing extremely hot summers by more than five times, and is likely to raise the odds by even more in the coming decades. The study comes from researchers at the University of Melbourne, and follows the approach taken in other analyses of recent extreme heat events, such as the 2003 European Heat Wave and Russian heat wave and wildfires of 2010. Such fractional attribution studies don’t seek a single cause of a particular weather or climate event, but instead examine how some factors may have altered the risk that such an event would occur. For the study, Sophie C. Lewis and David Karoly used climate observations and dozens of simulations from nine state-of-the-art computer models to compare summer temperatures in the historical record and in the near future, with and without the influence of manmade greenhouse gases, such as carbon dioxide. They found that the record hot summer of 2012 was unlikely to be due to natural factors alone. “The human contribution to the increased odds of Australian summer extremes like (2012-) 2013 was substantial, while natural climate variations alone . . . are unlikely to explain the record temperature,” the study said. The report found that natural factors actually favored a slightly cooler-than-average summer in 2012, since ocean surface temperatures in the tropical Pacific Ocean were slightly cooler than average. Warmer-than-average waters, which can be found during El Niño events, are typically associated with hot Australian summers. The second-hottest summer in Australian history, for example, occurred during a strong El Niño event in 1997-1998. Daily Australia's maximum temperatures (°C) during January 2013.
Credit: Australian Bureau of Meteorology. “This extreme summer is not only remarkable for its record-breaking nature but also because it occurred at a time of weak La Niña to neutral conditions, which generally produce cooler summers,” Karoly said in a press release. The 2012-2013 Australian summer set benchmarks for extreme weather in a country that is already well-accustomed to a harsh climate. The summer saw records set for the hottest day in the country’s history, with a national daytime maximum temperature record of 96.3°F, and hottest month on record (January). The temperature in Sydney climbed to a stifling 114.4°F on Jan. 18. A record was set for the number of consecutive days when the average daily high temperature exceeded 102°F, with seven such days between January 2-8. The previous record was four days in 1973. At one point during the January heat wave, meteorologists had to add a new color to the weather map as temperatures climbed off the standard charts. 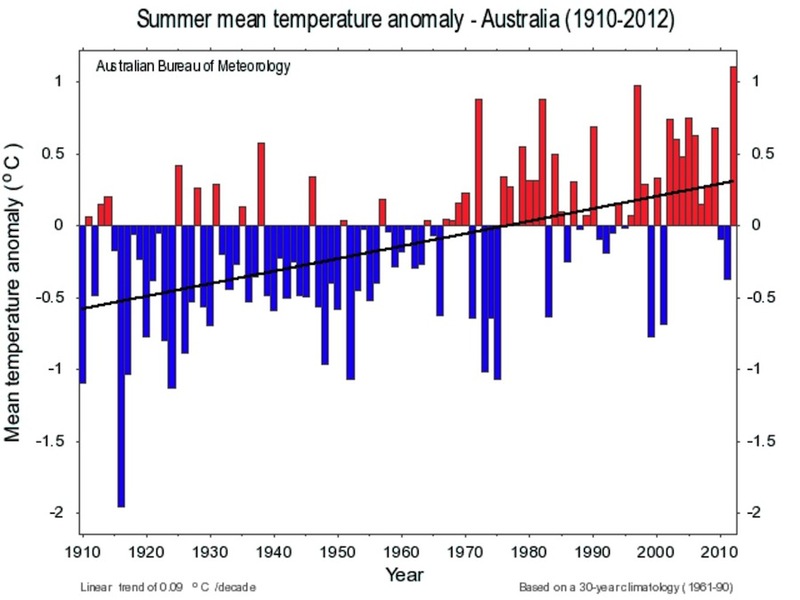 Summer temperature departures from average in Australia from 1910 through 2013, showing a clear increase in average summer temperatures during the period. According to the new study, meteorologists should keep that new color, and maybe add another one for even hotter temperatures, since the study found that the odds of record hot summers are likely to increase significantly by 2020 as average surface temperatures increase in response to manmade emissions of greenhouse gases. According to the Australian Bureau of Meteorology, average temperatures in the country have increased by 1.62.°F since 1910, and the extreme summer of 2012-2013 could be the norm there by the 2040s. A 2012 study published in the Proceedings of the National Academy of Sciences found that a new category of extremely hot summers, such as events that occurred in Russia in 2010 and Texas in 2011, has become far more common than would ever have happened without global warming. According to a press release, the analysis of the causes of the record 2012-2013 Australian summer is one of the fastest ever performed worldwide for a significant climate event, thanks to readily available data from climate models and observations from Australian government agencies.